An initial 240 civil servants will relocate to new headquarters in County Londonderry by next March, the Department of Agriculture, Environment and Rural Affairs has announced. The department is leaving its existing Belfast base in the Stormont estate and moving to Ballykelly. The aim is to decentralise hundreds of civil service jobs to outside Belfast. The relocation is one of the largest redeployments of government staff in Northern Ireland. The 240 staff members will move to the £20m facility in the first phase of relocation. The new building will be completed in February of next year. 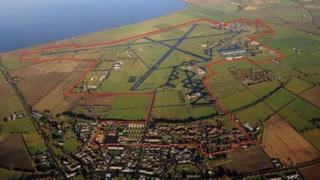 "Our plan is to have the initial 240 people in Ballykelly by the end of March 2018," a department spokesman said. "Plans are well advanced, with building structure completed and internal fabrication ongoing." The Ballykelly headquarters will have a capacity for almost 500 staff when fully operational. However, the move has also lead to fresh calls for a long awaited bypass to ease rush-hour traffic congestion in the area.